The top two sounds a school SLP teaches students on a regular basis: S and R. I don't think I realized how many students on my caseload would have difficulties with these sounds until I started my job and the previous SLP went over each students' speech difficulty. I looked down my list of notes of what I would have to research over the summer. Lisp, R, Lisp, Lisp, K/G, Apraxia of Speech, Lisp.....oh my. In grad school, most of the children I worked with who had speech-sound disorders had Apraxia of Speech or phonological disorder(s). I knew how to teach the speech sound structure for each sound and have had a lot of success teaching the R sound to students, but have had extreme difficulty with carryover of the S sound with my students. Some of my students were able to get to the carryover stage, but I have a students with lateral lisps that have been proven to be difficult to make it past the word/phrase levels. So, with permission from parents I took video of the students and brought them to our monthly speech meeting. I received a lot of feedback for different techniques (the butterfly procedure, using a straw, etc. ), but nothing seemed to work. Finally, my colleagues recommended that I check out materials, books, and online CEUs from Pam Marshalla. Pam Marshalla is a licensed speech-language pathologist who is an expert in articulation/phonological disorders as well as motor speech disorders. She has written many books including "Successful R Therapy", "Carryover Techniques", and "Apraxia Uncovered". When I found "Frontal Lisp, Lateral Lisp" on her website, I put in an order for it immediately. I am hoping that this book is the answer to my students' lisp difficulties and you can read my review on the book below. Pam Marshalla's book begins with a dedication to Charles Van Riper. Although she never met him, he wrote to her in appreciation of her speech-language therapy newsletter. Having attended Western Michigan University for graduate school, Van Riper had a major influence on my career as well. I remember watching videos of him in therapy with clients and reading information about him and his work at the college. It was great to see another speech-language pathologist who was greatly influenced by Van Riper. Marshalla discusses lisps from the ground up. Beginning with the basics, she outlines the differences between various phonemes that are affected by a frontal and/or lateral lisp. She details terms related to the shared phonemes including sibilants, stridents, and fricatives. Marshalla is very clear about which articulatory category each phoneme fits into in a table format, images of articulatory placement, auditory awareness activities, learning exercises, and in depth review of cognate pairs. The first two chapters are a good reminder of the starting point when thinking about articulation disorders. You can't figure out the problem until you know the right way to produce each sound and how they are related. 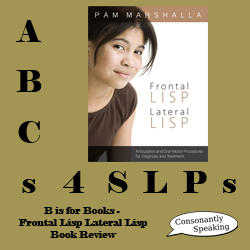 Then, Marshalla goes into depth in two separate chapters to analyze frontal and lateral lisps. She discusses how each one can occur, appropriate development of the sounds, structural problems that may be causing the disorder, and co-occuring difficulties such as swallowing disorders. In the next few chapters, she details various therapy techniques specific to frontal and/or lateral lisps with visuals and step by step instructions for each. These techniques include the "Long T Method", the "Cornerstone Approach", traditional articulation therapy techniques, using a straw or dental floss to help determine appropriate airflow, "Minimal Pairs", oral motor techniques, the "Butterfly Position", and auditory discrimination. Finally, at the end of the book, Marshalla discusses carryover and real, specific client cases of her own and how she treated the clients. What I like about this book is the fact that Marshalla provides step-by-step instructions and information starting from the basics up through carryover as well as visuals and tables for frontal lisps and lateral lisps. She keeps information very specific to each sound and lisp. Visuals shown are of articulatory placement with the tongue and teeth shown in the image. These visuals are great not only for therapists but to help clients who are able to understand them to visualize what they are doing and how to fix it. Another one of my favorite parts of the book is all of the pages that include lists of words, phrases, sentences, and paragraphs specific to phonemes, placement within the word, placement next to other sounds, and specific to the type of lisp. Marshalla has included these lists for you which is great because it makes therapy so easy when you do not have to look up lists of words or create your own! This book is great for speech-language pathologists who work in the schools because many of our students (elementary, middle, and high school) struggle with a lisp. If you have students on your caseload of whom you feel that you have tried everything with and they are still not making much progress, I would absolutely recommend reading this book. I have found some new techniques and insight into lisps that I am definitely going to use this school year to hopefully get some more hard-working students to progress towards carryover! This book is perfect for my therapy library and I know that I will be referring back to it often for myself as well as to show parents visuals of how their children are producing various sounds!